At the risk of sounding sexist … Riverside Theatre has opened a handsome production of a play that could turn husbands into theater patrons. 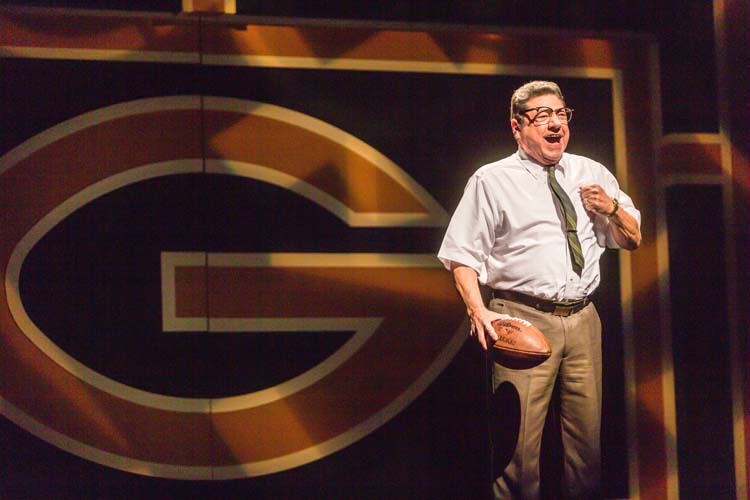 It’s “Lombardi,” a long one-act about famed Green Bay Packer coach Vince Lombardi, that is not a musical and doesn’t have an intermission, so even those husbands who went to Sunday’s matinee still got home in time for the Super Bowl. That’s probably the way Lombardi would have wanted it. No fuss, no muss. Just get the job done … in a winning fashion, that is. And that’s what director and designer Allen D. Cornell has accomplished with “Lombardi,” a show that is as tightly formed and smartly paced as any complex offense play jotted down on a coach’s blackboard. Cornell’s scenic design uses the outline of a football field, with Green Bay’s gold and dark green colors to serve as the backdrop. He takes you from Lombardi’s fashionable mid-’60s “Mad Men” era home to the locker rooms, the practice field and even a bar, all slipped into place in an instant. Into this landscape we meet Lombardi through the eyes of Look magazine reporter Michael McCormick, who has traveled from New York to Green Bay to stay at the coach’s home for an up-close-and-personal interview. Greg Fallick forges an earnest likability for the reporter, a young man struggling with his own father issues, who finds himself confronting a larger than life man in Lombardi. Denise Cormier brings to life Marie Lombardi, an attractive woman as adept at mixing a highball as she is advising her husband … and the reporter. But the show belongs to Richard Zavaglia, who carves out a rich portrayal of Lombardi. His mix is a complicated one – filled with gruffness and love, confidence and vulnerability. His Lombardi nearly aches with affection for his players, yet all the while he is a split-second away from lecturing them. Even when he yells “Shut up, Marie,” you have to laugh because you feel the tenderness between the two. The beloved football legend is the man in whose honor the Super Bowl’s Vincent Lombardi Trophy is awarded each year. The award processional includes the trophy being brought down a gauntlet of the players on the winning team. Each player tries to touch the trophy and sometimes even kiss it. But there is a threat of change in the air. It’s the mid-’60s and people are waking up. Players want more money, more health insurance. Sons want to spread their own wings and not fly in their father’s orbit. Lombardi complains, “Young people today don’t trust their leaders.” And Marie? Well, other than looking stylish in Anna Hillbery’s period costumes, she seems content to mix the drinks, maybe a bit too often for her own good. But that’s about as far as the audience is taken by Eric Simonson’s slim play, which is based on David Maraniss’ book, When Pride Still Mattered: A Life of Vince Lombardi. In fact, it’s not so much the play as Riverside’s production that advances the intriguing layer of social change. Where we first hear boos and cheers in Craig Beyrooti’s sound design, we end up hearing the Rolling Stones’ playful but sexually charged song “Satisfaction,” and then music by the Doors, a group so iconic of the ’60s drug culture. Beyrooti needs another compliment here. This is a straight play, meaning it’s not a musical. Normally, Riverside produces its straight plays on its smaller Waxlax Stage. However, that venue is busy so it was produced on the Stark Stage, Riverside’s larger mainstage. Nevertheless, the show has an intimate feel to it primarily because of the sound, which is rich and acoustic like a live theater of, well, the mid-’60s … long before body mics became de rigueur. “Lombardi” runs through Feb. 18 at Riverside Theatre, 3250 Riverside Drive, Vero Beach. Tickets start at $35. Call 772-231-6990 or visit RiversideTheatre.com.